Hurricane Florence was the first major hurricane of the 2018 Atlantic hurricane season. It made landfall in North Carolina in mid-September. While not technically a hurricane, the January 2018 North American Blizzard generated winds and waves of comparable magnitudes. Large waves from this event were measured by a dozen CDIP buoys stretching from North Carolina to New Hampshire. 2017 was an extremely active hurricane season in the Atlantic. The most significant impacts came from three major hurricanes in September: Irma, Jose, and Maria. CDIP's buoy network made extensive measurements of these events. In late October 2012, Hurricane Sandy moved north from the Carribean Sea and traveled up the east coast. 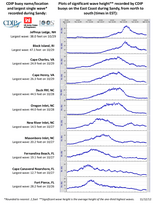 Thirteen CDIP buoys recorded waves generated by the storm, measuring significant wave heights of over 30 feet and individual waves of over 45 feet. In late August 2011, Hurricane Irene traveled up the East Coast, making landfall in North Carolina and again in New Jersey. 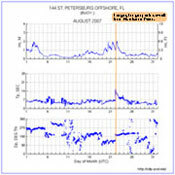 CDIP buoys from Florida up to Canada recorded the impact of the storm. The largest waves recorded were at CDIP's Block Island, RI buoy, with a significant wave height of over 30 feet and individual waves up to 48 feet. 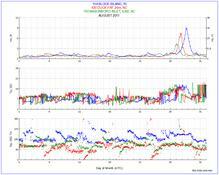 CDIP's Duck, NC buoy recorded a significant wave height of over 25 feet and individual waves up to 43 feet. 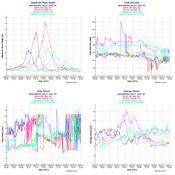 In all, five CDIP buoys measured significant wave heights of over 4 meters (13 feet) from Irene. 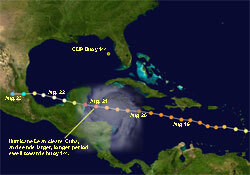 In late August 2007, Hurricane Dean made its way through the Carribean Sea. CDIP buoy 144, approximately 82 nautical miles offshore Tampa Bay, FL in the Gulf of Mexico, recorded swell from Dean as the storm moved west of Cuba's shadow.